Who thinks about tires? Well, if you are someone who is into wheels and tires as a customization for your car, you probably do. But your wheels and tires are much more than simply an accessory to make your car or truck look good, they are integral to the overall performance. The size of your wheels and tires mean much more than aesthetics, they are your only contact with the road. At Kearny Mesa Automotive and Transmission we are proud to offer exceptional wheel alignment as well as superior vehicle repair and transmission repair/replacement. Let’s talk a bit about your tires and why they are so important as maintenance items on your car or truck. As crazy as it sounds, your vehicle only rides on a few precious inches of tire rubber actually touching the road. Each tire must grip the road at the precise spot and in the case of our typical pneumatic tires, they tend to flatten out as compared to something like a locomotive. The contact patch of a steel locomotive wheel is no bigger than a dime, meaning that all of the weight of the train is resting on these impossibly small segments of the track. Of course due to the tracks that the train rolls down, the steel locomotive wheels do not need to be relied on for dampening, as the tires are in automotive applications. Back in the day, wheels were made from wood and metal, much like the wheels of a train, when rubber tires were devised to be mounted on those wheels, this increased the contact patch and thus, the ride improved drastically. The wider contact patch coupled with the flex of the rubber and dampening of the air in the tire creates the ideal ride. While the contact patch matters, it is really the construction of the tire that provides the ride we are so accustomed to. Your vehicle’s suspension is in charge of maintaining stability and handling but tire construction can have a huge effect on the way a car drives. Long ago tires were what is known as bias ply construction. Bias ply is simply the orientation of the belts inside the tire. Cords and steel form a mesh that crisscross the tire. Bias ply tires do not ride as nice as their radial counterparts and are much more susceptible to flats and punctures. Before radials appeared on the scene it was not uncommon to have a flat tire, and changing a tire was a skill that was passed down generations. Bias ply tires have more flex in the sidewall than their, stiffer radial cousins and it is not uncommon for them to be used on serious off road trucks and motorcycles. While bias ply tires still have their uses today, almost all passenger vehicles are fitted with radial tires. Radial tires are smoother and much stronger over a variety of speeds than bias ply. Radials are constructed in segments to enhance the smooth riding characteristics that make them far superior. While compounds and design of modern tires has drastically increased reliability and allowed some sets of tires to eclipse fifty thousand miles, tire pressure is still the most important aspect of automotive tires. Tires are chosen by the factory when the vehicle design process is in progress, they are tested and the engineers will determine the optimum tire pressure for the vehicle over a wide range of surfaces. The factory will then stick a vehicle specific sticker somewhere in the drivers side door area. This sticker will list tire sizes that the vehicle came with and ideal tire pressure for each load rating. It is important that when checking tire pressure, these values be followed. Many will simply check the sidewall of the tire for an inflation pressure and they are not always correct for the vehicle. The sidewall of the tire will list the maximum tire pressure for that particular tire, not necessarily the recommended tire pressure for the vehicle. An improperly inflated tire can spell disaster for the driver when they least expect it. An overinflated tire can actually decrease the contact patch while the vehicle is in motion and therefore lead to more wear in the center of the tire. If you have a strip of wear in the center of your tire it is usually due to overinflation. A tire that is underinflated will actually spread out and increase the contact patch. This is why you will see off roaders and those who drive in snow, lower the tire pressures slightly. This increases traction in slow speed situations. 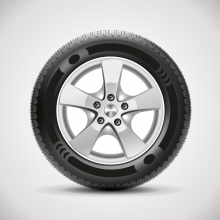 An underinflated tire will show signs of wear on the edges of the tread. We can’t stress enough how important proper tire pressures are for the safety of your vehicle. On a motorcycle the steering is simply turning the handlebar and the wheel responds in the manner in which was intended. Meaning that direct response is a characteristic of that type of steering system. On a car or a truck the process is much more complicated and in order to get your turn on the steering wheel to the tires the action must go through a variety of components. These components, if out of alignment, can cause the vehicle to handle badly, increased tire wear and even lead to premature tire failure. A tire alignment at Kearny Mesa Automotive and Transmission will include a variety of measurements and adjustments. Before any alignment is performed, it is a good idea to have your tires balanced and rotated. Balancing a tire includes spinning it at high speed and evaluating where the tire and wheel are out of alignment. When the offending areas are identified, weights are added in order to perfectly balance the tire. A balanced tire is necessary to begin the alignment process. To properly align a vehicle, all of the suspension components must be in good shape or the alignment will be unsuccessful. Parts like the shocks, springs tie rods, wheel bearings and even the steering box can cause an alignment to go bad. There you have it, a bite-sized version of tires and wheel alignments. We cannot stress enough how important your tires are to the safety of your vehicle. If you suspect an issue with your suspension, tires or alignments please do not hesitate to contact Kearny Mesa Automotive and Transmission for assistance. We are proud to offer competitive prices and superior service to our friends and neighbors in San Diego. We look forward to hearing from you and thank you for your business. Next time we will talk more about alignments and tires as they relate to performance.